One nice consequence of doing this was discovering that the parent of one of her friends was also a member of the Puffin Club – now a teacher! I was also contacted by another founder member who had come across this site – sadly she only had one letter from another member on club stationary as a memento. She also has a polaroid of her as a child in her bedroom with one of the (now very) rare Puffin Bookcases. These were a short run item that could be bought at selected Puffin outlets around the country. As far as I have been able to find out, these are excessively difficult to find as they tended to get thrown out when the Puffin books were outgrown – or didn’t survive moves. I’m sure there are some still out there in varying states of repair – hold on to them! They are going to increase in value. After careful consideration (despite asking permission), I have chosen not to post the picture, as I feel it would be inappropriate. I will locate one of the photos that were taken for Puffin Post as this shows it very clearly. *I have removed my daughters name electronically for her protection! What a great cake! Is there no end to your talents 🙂 Hope your daughter had a great party. You’re very kind, but I know my limitations – it was a great party! 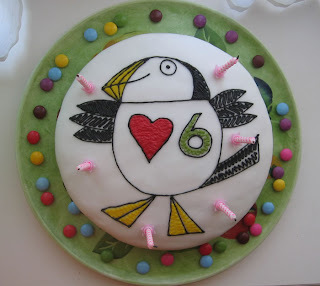 I love puffins! Actually Im from Argentina and they do not exist down here (in fact nobody knows them!) but they mean so much to me! Im so glad I’ve found your blog… It’s perfect! Keep on with it!! I certainly intend on keeping this blog going – the distractions of the other aspects of my life are keeping me occupied at the moment. There will be more soon.